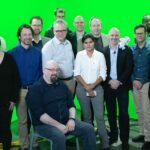 This video is part of the appearance, “VMware Presents at Tech Field Day 18“. It was recorded as part of Tech Field Day 18 Austin at 15:30 - 17:30 on February 7, 2019. John Nicholson, Sr. Technical Marketing Architect, and Nigel Hickey, Technical Marketing Engineer, walk through the year as an admin. In this third video, they discuss scalability. How do we do this again? They also demonstrate vROPS and Quick Start.